Webpage created: June 30, 2017. The Royal Marine Memorial stands on the seaward side of the Royal Citadel, Plymouth, overlooking Plymouth Sound. 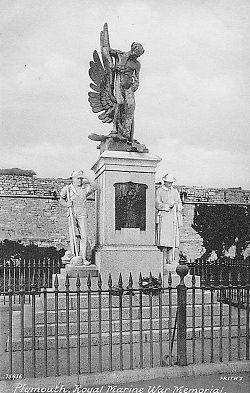 It was erected at the suggestion of Mr W C Storr-Barber of Leominster in Herefordshire, who was serving in the Royal Marines during the Great War. At each side of the pedestal are stone figures sculpted by Mr Storr-Barber himself. The one on the left is "Per Mare" and shows a Royal Marine in shirt and trousers, with bare arms and holding a rammer. The one on the right, "Per Terram", is a Royal Marine in fighting order, wearing a greatcoat and tin helmet, resting on his arms reversed. The memorial was unveiled on the afternoon of Tuesday November 8th 1921 by Earl Fortescue, Lord Lieutenant of Devon. A Guard of Honour, in full ceremonial dress, with white helmets, stood behind the Memorial, facing out to sea. In front were the Officers and other ranks and to the east was the Band. Among those present were the Mayor of Plymouth, Mr W S Knight; the Town Clerk, Mr R J Fittall; and the Adjutant-General of the Royal Marine Light Infantry, General Blumberg. There was also a representative of the Royal Air Force, Squadron-Leader Breese.